Firstly, guess what word has suddenly found its way out of Paige’s mouth…yup, you guessed it…NO! At 18 months and 10 days she has decided that now is a good time to vocalise her refusal to do things, instead of just shaking her head like a crazy person or running away shrieking with laughter at her own defiance. She already has a handful of other little words under her belt (that we can understand) and quite a few of her own vocab concoctions that she uses to talk about certain things, like favourite toys, or the dogs, or things that we see when out and about. 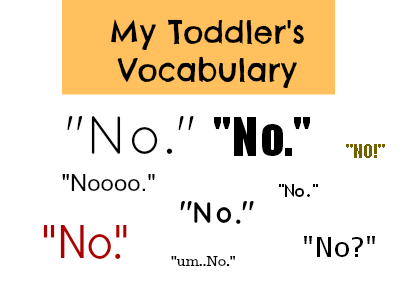 But wait, now instead of just kicking and screaming when you pull her away from a game to change her nappy, she is adding the No-No-No-No-No to her little script – in quite a loud and high pitched manner. The neighbours must think we are completely batty. I know that (most) parents across the globe experience a phase with their kids when nappy changing becomes the most exhausting activity known to man – but wow has Paige got her prevention tactics down to a fine art. It has become physically dangerous. I am not even kidding! First you actually have to catch her, and then get her to lie still for more than 5 seconds. With the kangaroo punches, pony kicks and sudden rotations (like crocodiles do when they are attacking their lunch) you have to be on guard at all times to avoid her making contact to any of your own body parts – those pony kicks are hectic. All I can say is changing nappies during this unbearable phase is not for sissies, and I can only hope that it doesn’t last too much longer because being preggers in my first trimester is tiring enough without a full workout every time Paige needs a new nappy. I am quite literally out of breath by the time the chore is over with and all she does is quietly get down onto the floor, and toddles off back to whatever she was doing before…leaving me to pick up wet wipes, the bum cream, other clean nappies ripped from their bag and any toys she might have been holding that were thrown around the room. Hurricane Paige strikes again. This entry was posted in being a parent, kiddie vocab, personal experience and tagged nappy changes, NO!, patience, toddlers. Bookmark the permalink. I have a little hurricane also. Nice to know I’m not alone.